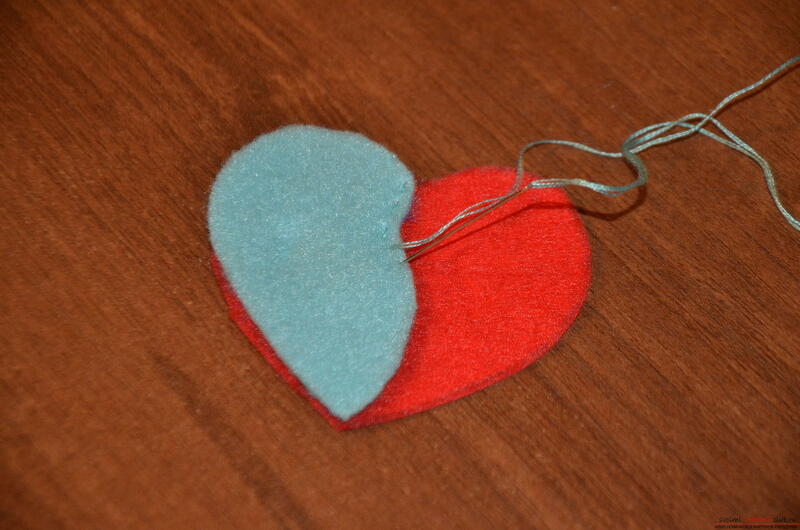 This master class Valentine will teach you how to make your own heart with bullfinches made of felt. 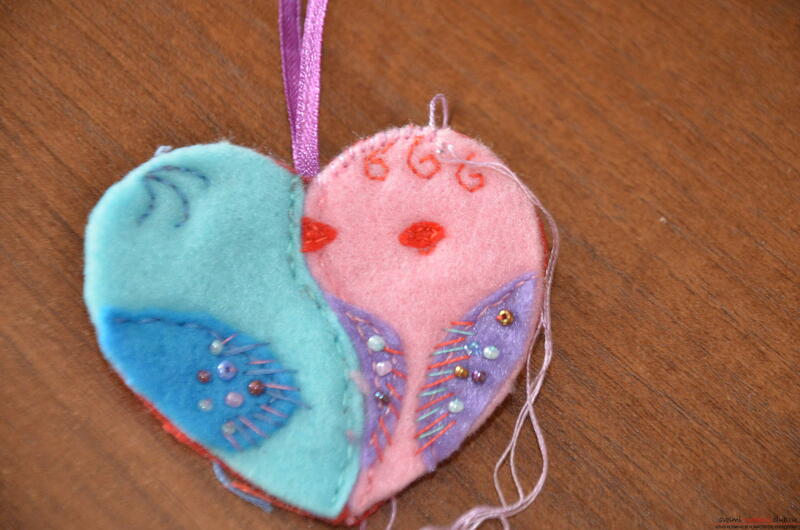 By Valentine's Day, I propose to sew such a small gift "Birds in the heart". 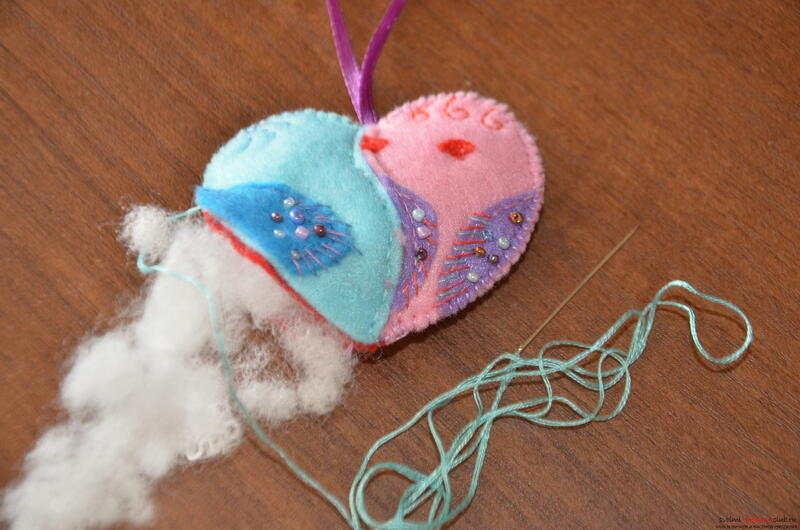 We will need: • paper for the template • simple pencil • scissors • felt (sheet or cut of fabric) • threads and needles • beads • sintepon or cotton wool for stuffing • piece of ribbon or rope 15-20 cm (for eyelet) • glue eye • transparent glue. 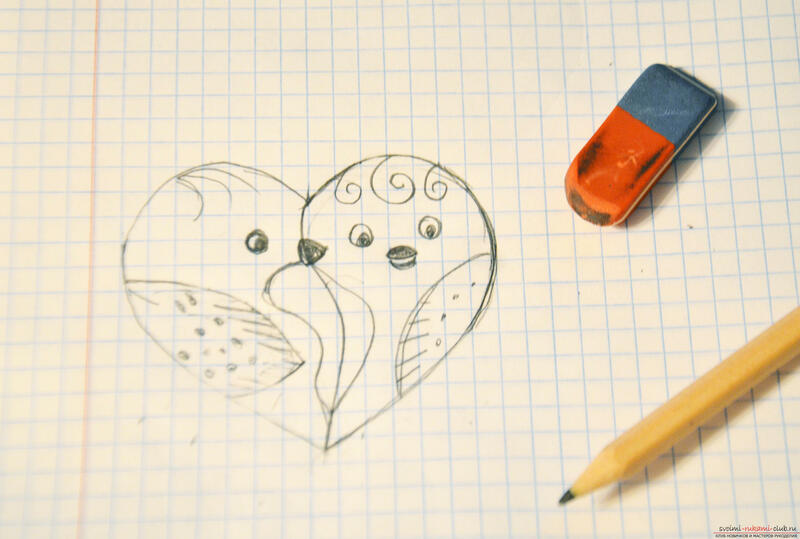 Draw by hand the heart. 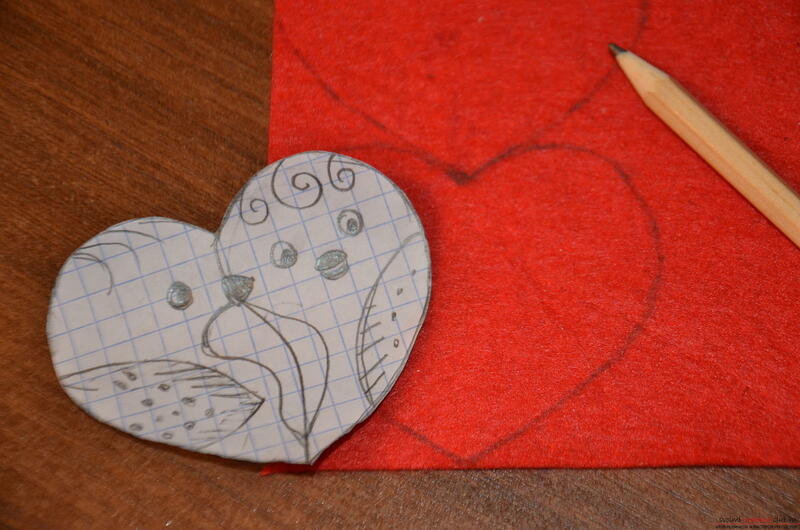 In the hearts of hearts draw birds. 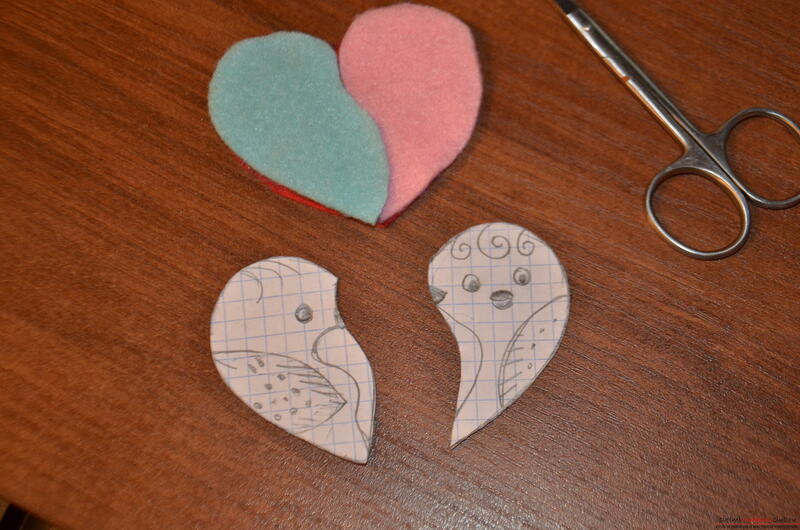 Of course, not all, it turns out, to draw, so I apply my drawing, on it you can sew, a toy with birds just print. 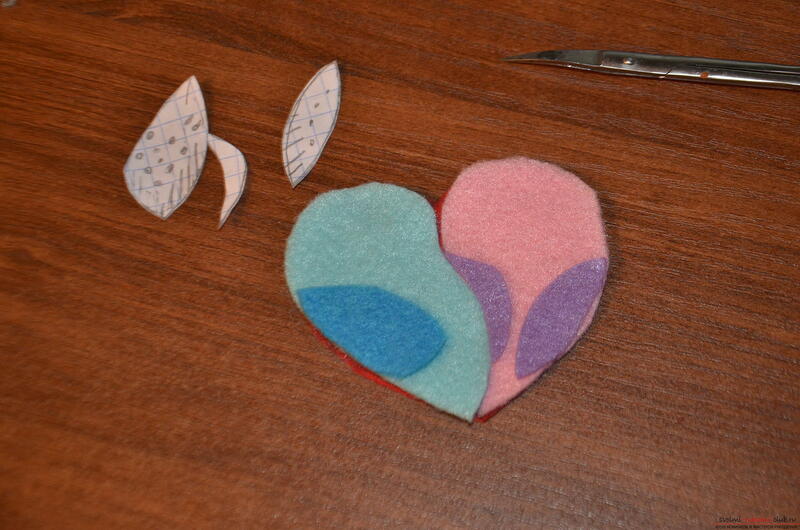 Cut first the heart itself and outline it on the felt two times. 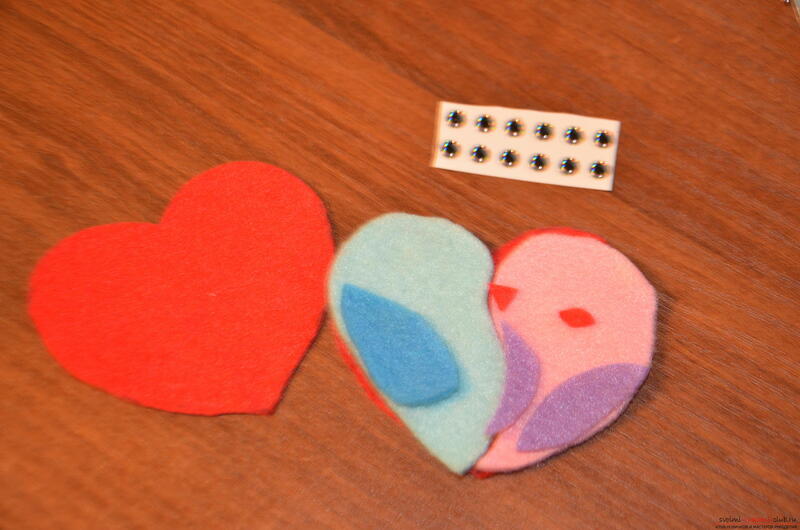 We cut out, we get two hearts, one will sew birds, and the other will be empty. 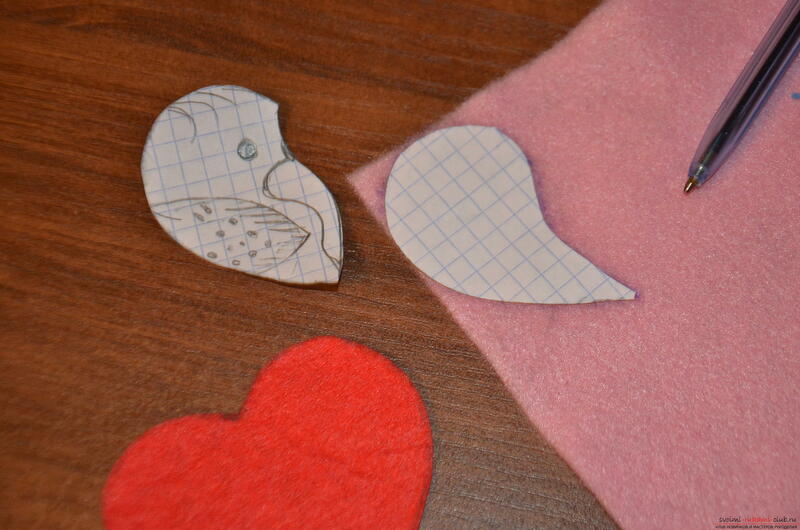 Cut out the birds themselves from the pattern and cut out the details of felt from them. As the details of the bird body are cut out, you can cut out the wings and beak. 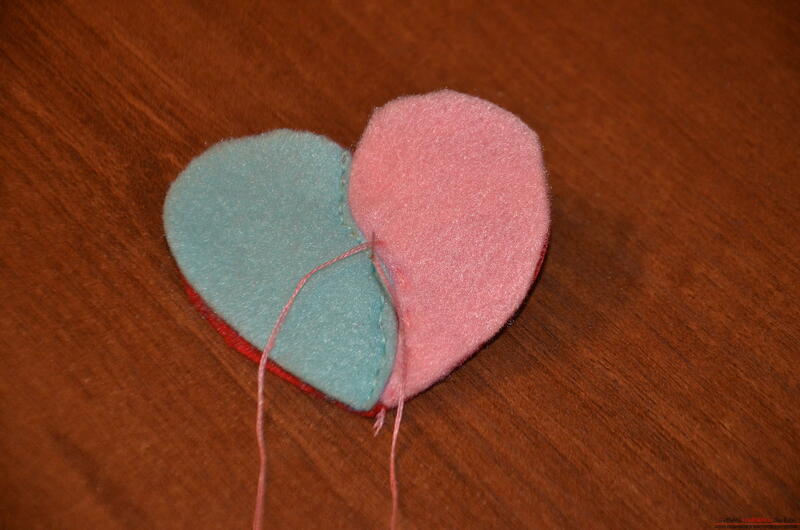 From the beginning of the pattern, and then along them from felt. 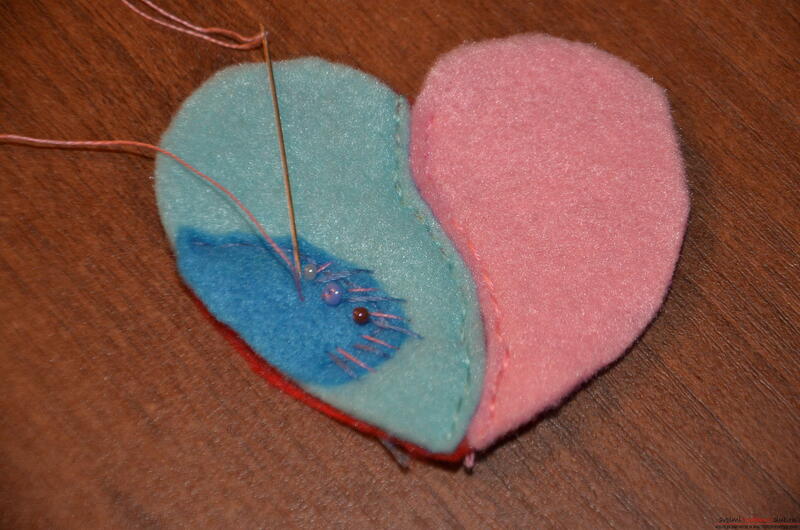 All the details of the birds are laid out on the heart and begin sewing with a suturing stitch. We turn and sew again with this seam back filling in empty spaces. Sewing only in the middle. 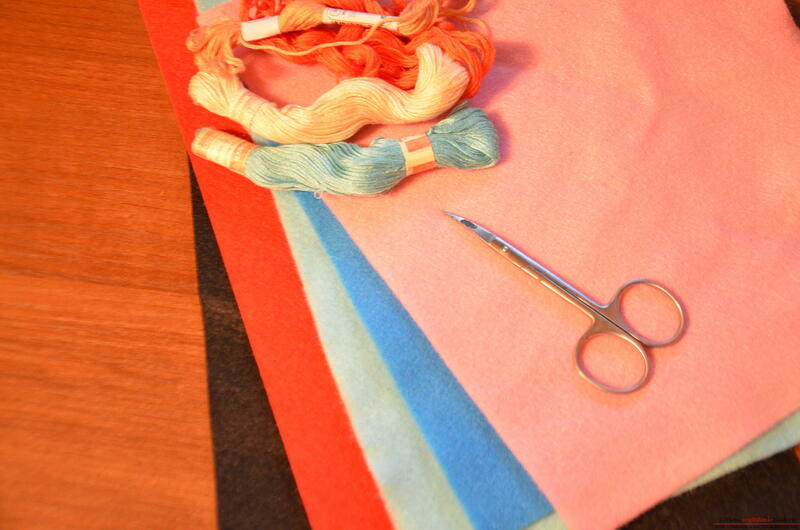 After the bodies of birds are sewn, we begin to sew the wings with the same seam. 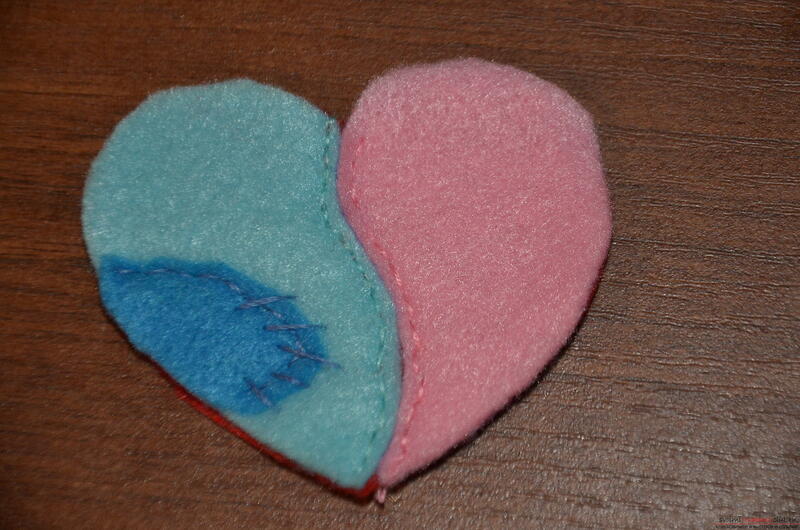 We can use two colors in different colors embroidering feathers. 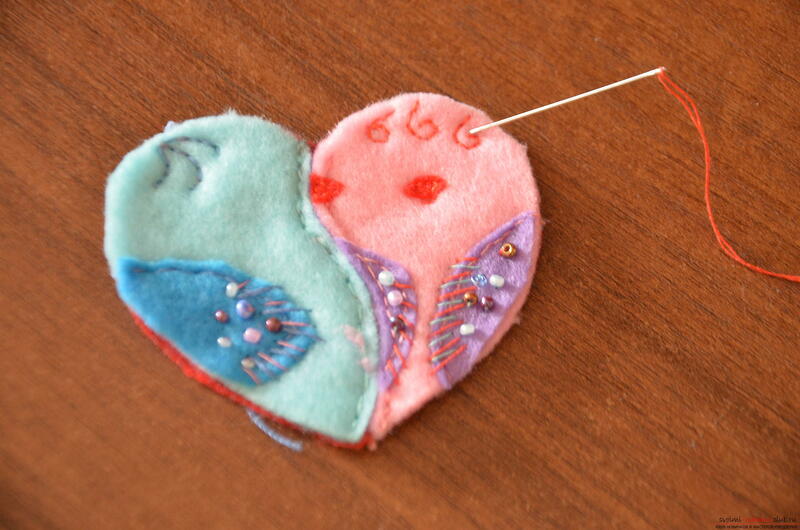 A little sewn beads on the edge of the wings. Next we sew the beaks, but we try to make the seam finer. Whatever the material is deformed. On the crowns of birds embroider hairs. Girl curls, and boy chelochku. 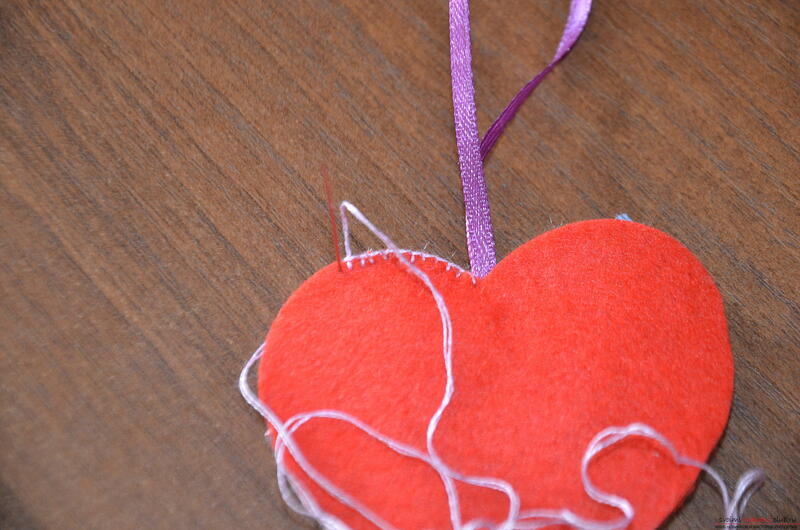 After the application from the birds is sewn, we begin to sew the details of the two hearts together. 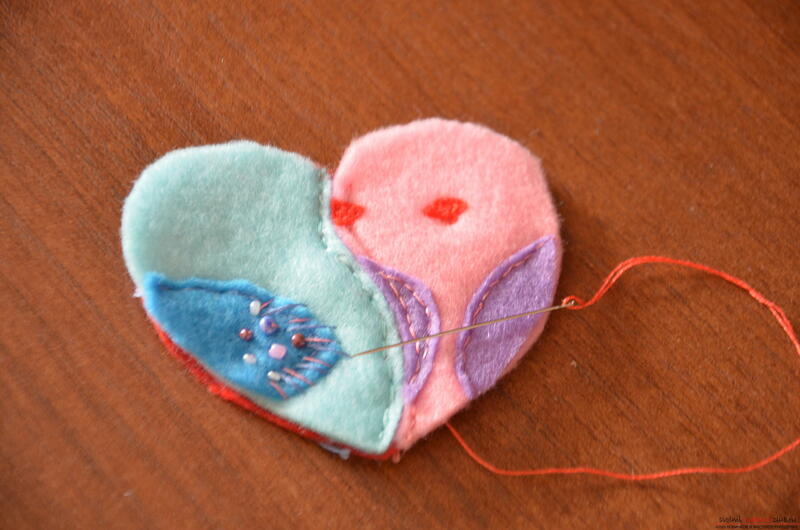 Inside, sew a ribbon or string in the form of a loop. 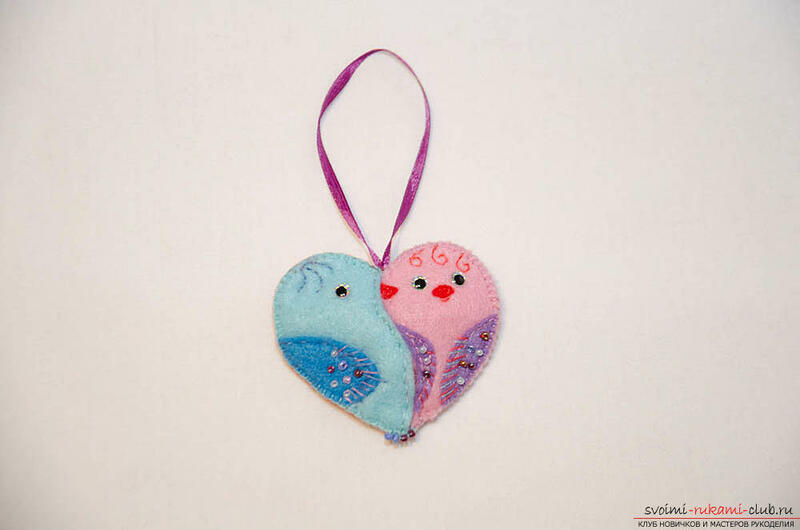 Below the heart, sew a pair of beads, which would visually be similar to the paws of birds. 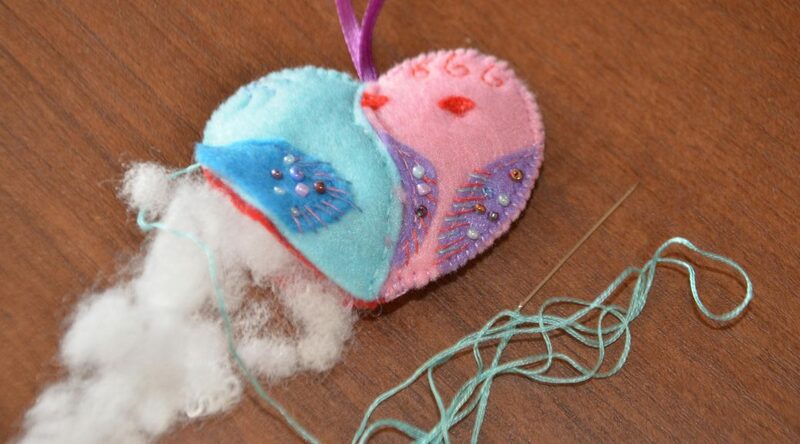 Having sewn most of the toy, leave a small hole in it, stuff a little sintepon or cotton wool. Glue the eyes. Eyes can be glued to ghost glue. That's all, the toy is ready. 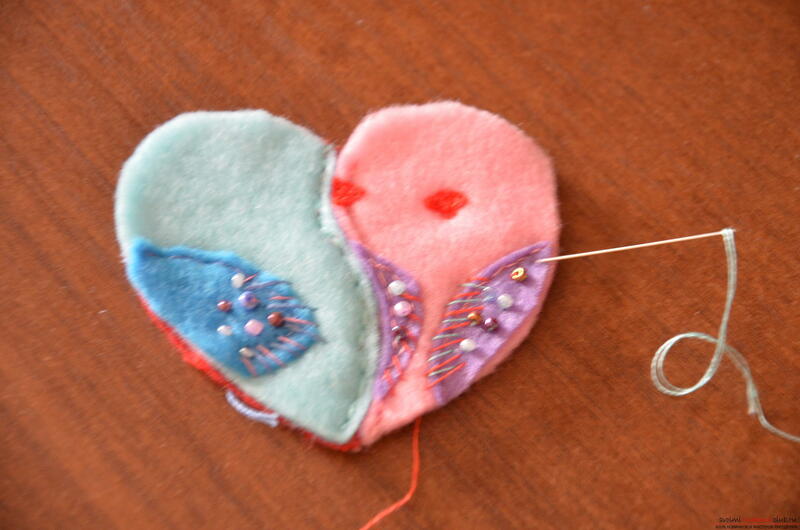 This master class on crochet will teach you how to make a heart charm with your own hands. This master class will teach you how to make a card with your own hands in the style of ayris folding. This master class with photos will teach you how to make a house of paper with your own hands. This master class will teach you how to make your own beautiful quilling cards. This master class will teach you how to make a vase with your own hands from a modular origami. How to tie an openwork square with a crochet, an image, a diagram and a description of the work. This master class will teach you how to make a topiary with your own hands using a photo and a detailed description.